Do We Need an Early Closing? 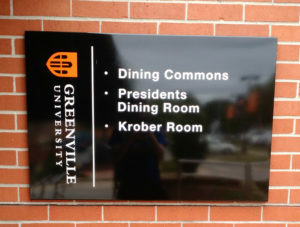 Dining Commons Sign. Photo by Kelsey Middleton. 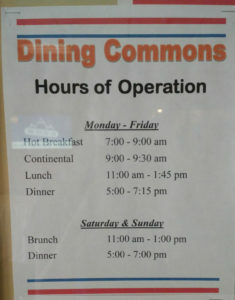 It has recently come to my attention that the Dining Commons at Greenville University seems to be closing earlier than it needs to be. Though this is not happening by denying students entry or by not allowing them to eat, it is occurring by slowly taking away food options until there are so few left that there is almost no variety or selection for those eating at the DC. 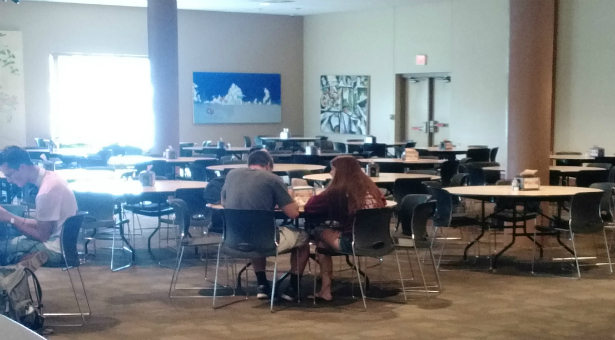 I have had other students bring this to my attention recently, and I began to think about the many times that I entered the Dining Commons around the time that the athletes and other students who take part in extracurricular activities came in. Reflecting on these times, I recalled that most of the options for a well-balanced meal were gone. After the issue was mentioned once again, I decided to talk to a few other students who were experiencing this or seeing it happen. I asked a few people that I encountered at the DC to speak with me to discuss the issue and share their opinions on the matter. I then interviewed two student workers from the Dining Commons, Jessy Amaro and PJ Reincke, as they had also taken notice of this issue. In voicing their opinions, they hope to bring about possible changes to the food choices offered to those who arrive at the DC during its later hours. I believe every student pays the same price. Whether they come in at opening time or closer to closing they should all get the same choices. This soft close is dead wrong. The only reason I see for doing it is to cut Labor. Why should us students pay this money and not receive the proper food service we deserve. If Sodexo can’t see what they’re doing is wrong. Then I hope the school officials can. Has anyone taken the time to talk to sodexo mgt to see the reason for this rolling close. If indeed there is good reason. Could there be a different approach to solving the problem. I agree with previous comment. What’s offered the first student through the line should be offered to the last. How about looking at the hours of operation maybe opening a little later and closing a little earlier could be the answer. There’s got to be a way to satisfy both the needs of the customer and sodexo.